Reliability and high performance are key factors for many. With the Rectus R5 suction motor you get a complete solution for up to 5 units, and the suction motor is compatible with different versions of Rectus separation tanks as well. The Rectus suction motor is unique in the modern industry and when you buy a new suction motor from Rectus you get a quality product produced by experienced danish workers - and the lifetime of the product far extends similar products on the market! The motor is based on a traditional electrical motor, which runs a powerful turbine. Inside you have an intelligent control system, thermostat controlled cooling fan and a hourmeter. 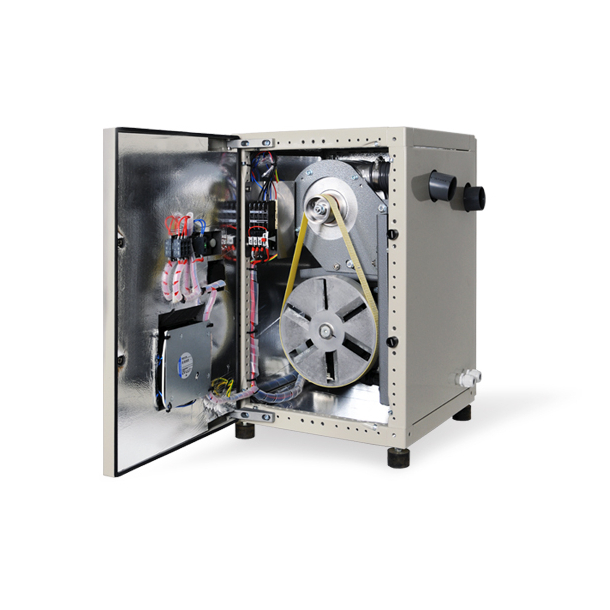 The suction motor is mounted in a powder coated cabinet with special sound and vibration proof material. You can also get a special cover for outside use, and with an integrated heating element inside. So if you want a quality product with extraordinary lifetime Rectus R5 suction motor is an excellent choice!